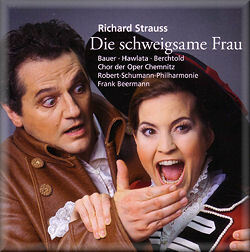 Strauss was already seventy when he composed this comic opera. It contains all the features typical of the works of his later years: a very fluid admixture of Sprechgesang and recitative, sparkling orchestration, sudden passages of soaring lyricism alternating with almost Expressionist jaggedness and a tendency to "talkiness" which places greater weight upon the quality and audibility of the libretto. This latter was the result of his only collaboration with Stefan Zweig before the Jewish author had to flee via Austria, London and ultimately Brazil, where he and his wife committed suicide in 1942. Premiered in 1935, the opera has never been amongst Strauss's most popular. Like "Intermezzo", it is probably too wordy ever to be so but it has its fervent admirers. I certainly enjoy it but could not, in all honesty, place it amongst my favourites even in as good a performance as this. Despite being based on Ben Jonson's play, “Epicoene or The Silent Woman”, it appears to be a direct rip-off of "Don Pasquale", itself yet another manifestation of a time-honoured, archetypal plot: a silly old man seeks to disinherit a deserving nephew by marrying a supposedly biddable young wife. I hope I am not offending die-hard Straussians if I say that I find I prefer to think of this opera almost as much as a play set to music than an opera. That said, I suppose there is a perfectly good argument for saying that is exactly what an opera ideally should be - and both Wagner and Hofmannsthal would certainly agree. The libretto is literary and rather good, as you would expect from a celebrated playwright. It helps if your German is up to snuff or if you at least follow with the German-English libretto provided here. It is in some ways more subtle and certainly more moving than Donizetti's version. The Grumpy Old Man is a sympathetic figure despite his peccadilloes, who truly seeks love and is initially grateful when he thinks he has found it. Whether the music is the equal of Donizetti's, I leave to you to decide. For many, the preferred recording has long been the live, mono, Salzburg Festival performance from 6 August 1959 under Karl Böhm – always at his finest in Strauss. Obviously this modern digital recording scores over that one in terms of sheer sound. It is lovely to hear orchestral details that are swallowed up by the cruder acoustic of the old recording. Apart from that given advantage, it is hard to find anything else from Chemnitz which is superior - certainly not the tenor Bernhard Berchtold, who sounds strained, small-voiced and over-parted. Even if he had not the misfortune to be up against Fritz Wunderlich in freest, most lyrical voice, he would be unimpressive. His last aria, “Willst du wirklich mich nicht kennen?”, with its murderously high tessitura, comes close to being an embarrassment. It is so poorly sung in a very uncomfortable, mixed falsetto whine. The best singer here is soprano Julia Bauer; there is a touch of steam whistle in the voice but those top notes are mightily powerful and impressive. She characterises convincingly, even if she is not as charming as Hilde Güden. Franz Hawlata is in good voice as Sir Morosus without quite conjuring up the larger-than-life humour that Hotter finds in the role. Even if Hotter is a little breathy and hollow-toned, he is compelling, singing on a large scale. You will immediately hear this in the “Bells” aria early on in Act 1, where Hawlata is more gravelly, restrained and given to Sprechstimme. Andreas Kindschuh displays a handsome baritone as the Barber but even he cannot be expected to eclipse the suave Hermann Prey. The wobbly alto Housekeeper is no asset. Conductor Franz Beermann must be congratulated for enabling an essentially provincial orchestra to rise to the occasion and cope with this highly complex score with its tricksy cross-rhythms. That said, they are not the Vienna Philharmonic and Böhm points the humour more wittily. Both the DG issue and this new recording offer a full libretto and English translation. In short, unless modern sound is essential to you, there is little reason to opt for this new recording if you want to hear this late flowering of Strauss’s theatrical genius.